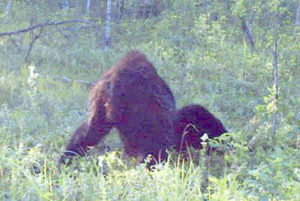 Home » CRYPTOZOOLOGY » Is This an Image of Bigfoot? This cryptid article comes from the excellent paranormal news site Week in Weird. An image from a trail cam in Alberta, of what appears to be a Bigfoot kicking back and relaxing. The author of the letter took the time to brighten up the image, and if it isn’t a hoax, or a misidentification, it would be one of the clearest pics of a Bigfoot since the Patterson-Gimlin footage. Here is a link to the original article. What do you think? Could this be a bear or a person in an ape suit? Maybe a gorilla? You decide.